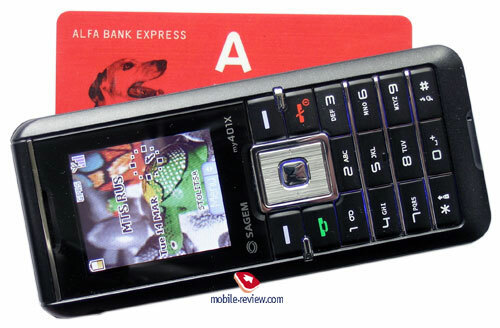 This model is the successor to pretty popular my301x model from Sagem. 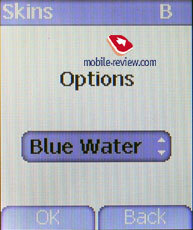 The new model has updated design, new display with bigger resolution and VGA-camera. Just like the predecessor, the 401-x model has Bluetooth, fully-functional IrDA and possibility to synchronize via SyncML. The phone’s sizes remained the same when compared to the previous model, 301 – 105x46x14. The officially stated weight is 84 grams, which is lighter than the 301x by 4 grams. Most likely this is result of usage of different plastic for the case. The phone fits nicely into one’s palm, thanks to its pretty small size it can be carried around in pocket of trousers or shirt. It’s not like the new design is totally different from what we’ve seen in the previous model. The changes were more of cosmetic type, biggest changes concern the keyboard, several insertions styled as “metal” appeared, this added number of points to the attractiveness. Despite the changes, the phone looks as modest as the predecessor. The model is presented in two colors: fully black or white, in case with second type the framing will be black. The phone’s case is made of qualitative plastic, unlike 301x the surface is not glossy as a result it’s not easily soiled. 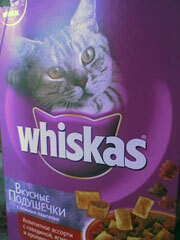 The new surface is more scratch-proof than the previous one. The overall assemblage is great, all details match each other, nothing is squeaky, neither there’s any sign of backlash. Camera activation button is located on the left side, IrDA is located nearby. Interface connector is located on the right, hole for the strap is located on the right too, just a little bit higher. 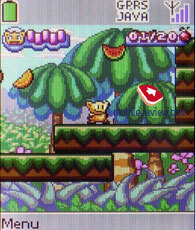 The cSTN display with 128x160 pixel (27x32mm) resolution is located on the front panel. It can display up to 65000 colors. 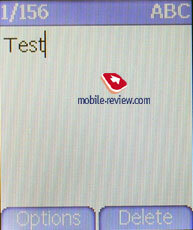 The quality of the display is higher than quality of the one installed in Sagem my301x. Display installed in my401x is brighter, contrast and its resolution was improved. 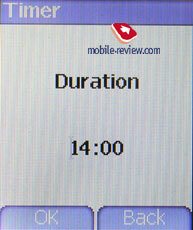 The information remains unreadable when the phone encounters direct sunlight, this is typical for STN-displays. 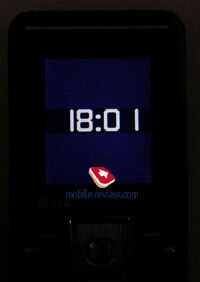 In the stand by mode, after the backlights shuts down digital clock appear on the screen. The keyboard faced major upgrade comparing to previous model. 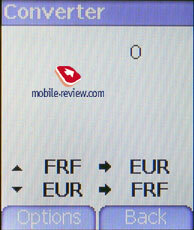 The four-positional navigation key is made in shape of rectangle. It’s pretty large and the convenience is great. 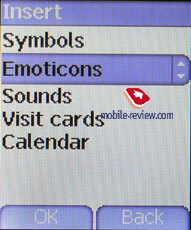 Two soft-keys and call/end call buttons are middle-sized, they are placed tightly next to each other. Despite this, they are convenient, the buttons are bulgy, that’s why there’s no awareness that you might press button located nearby by accident. The buttons at the keypad are middle-sized, they are placed tightly to each other in horizontal rows, there’s a “metal”-styled insertion between each row. The buttons are bulgy, that’s whey they are comfortable to work with, usually you don’t press other buttons by accident. The only key that is hard to work with is “2”. 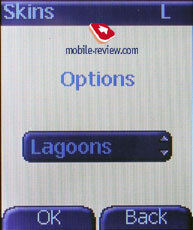 This is because navigation key is stretched downwards, as a result “2” key had to be reduced in size. Quite often you end-up pressing the very-same navigation key instead of the desired “2”. When my401x’s keyboard is compared to my301x then it’s clear that the new keyboard is better, far more convenient, although it has its own drawbacks. The keyboard backlight is blue, it is not spread evenly, the central vertical raw lacks backlight, and in darkness its symbols are almost unreadable. VGA camera is located on the backside, small mirror for self-shots is located nearby. The lens is located more to the left side, therefore it is slightly pushed downwards. By placing the lens in such original manner the manufacturer suggested that you should hold the phone horizontally when taking shots, this way it seems more like a digital camera. 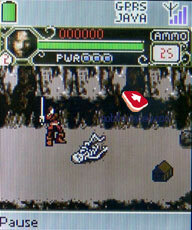 In reality this seems amusing, because of the VGA camera of course. 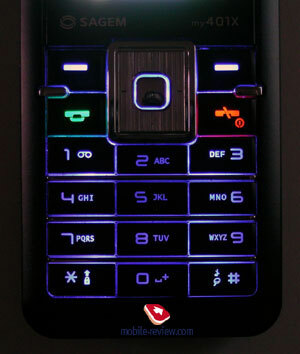 The back side of the phone is battery’s cover. It can be removed after pinching it up from downside. The removing mechanism is not convenient, the cover can be broken easily in case you are not careful, the users should be aware of that. The holding is not so reliable either, after some time backlash will appear. The Li-Ion battery with 850 mAh capacity is located beneath the cover. 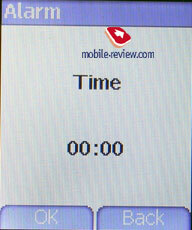 According to the manufacturer, the phone can work up to 4 hours in talk mode, and up to 350 hours in stand by mode. In Moscow the phone worked for about 3 days with 15 minutes spent for phone calls daily and up to 20 minutes spent for usage of other features, the Bluetooth was enabled. It takes around 2 hours for the battery to charge up. 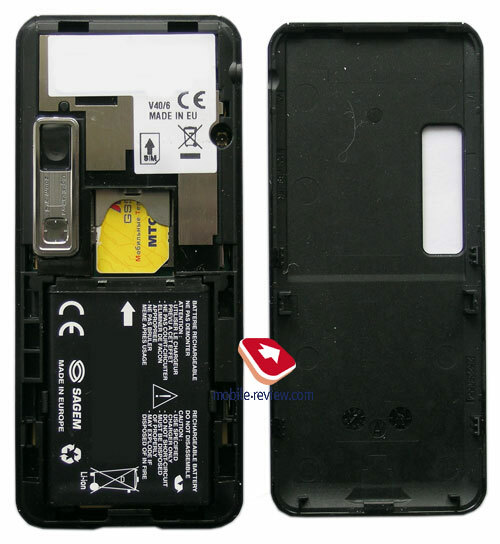 The sim-card is not located under the battery, it is put inside the case instead. It can be ejected only after removing the battery. 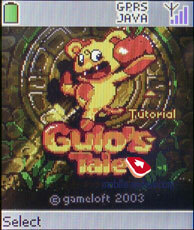 The main menu has the appearance of 3x3 grid with fair icons quality, they are small too. 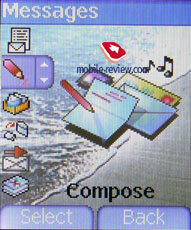 The sub-menu, found in the device, is also displayed as a grid: a large icon of a selected item in the centre and a list of four smaller icons on the left side of the screen. 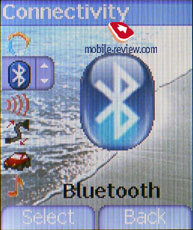 The device features fast number navigation, though it can be used only in the main menu. 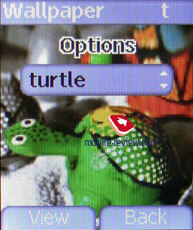 Both left and right functional keys can be assigned for fast access to selected menu items. Notable that the keys are tied not with one item, but with a listm, consisting of seven items. By using left or right functional keys while at the device’s stand-by screen, you’ll bring up the fast access menu (with only one item displayed at a time), which can be browsed by pressing the navigating key vertically. 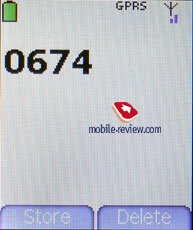 The handset is localized pretty good, however some shortenings are still present there. 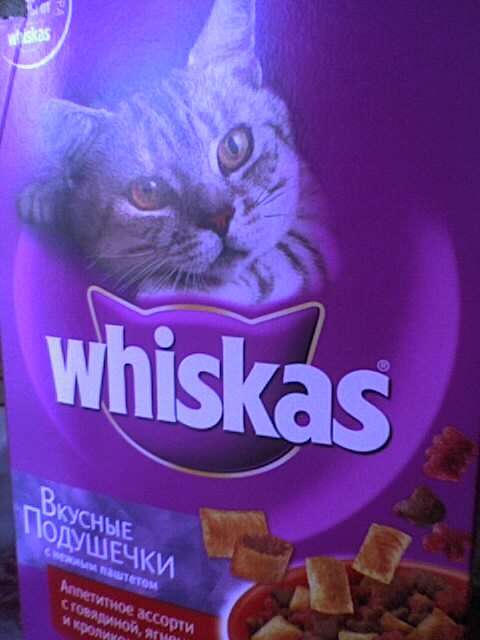 The phone has one small problem with Russian fonts. 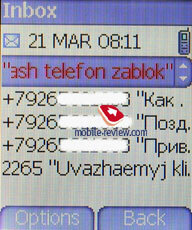 Even in localized phones that are shipped officially to the market, you cannot input messages or contacts in Russian. 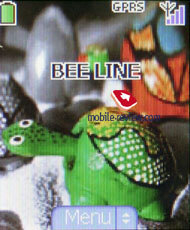 This bug is typical for Sagem, but it will be fixed within 3-4 months after the model will be released on the market. Phonebook. 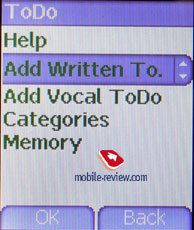 All contacts are stored in the main memory of the device, though the phonebook’s capacity depends on available free memory. 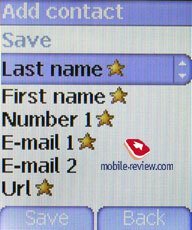 For each entry one can write down fist name, last name, up to 3 numbers of different types (mobile, home, work, etc. ), 2 e-mail addresses, homepage address, company’s name and a short text note. 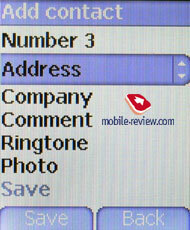 Besides each contact can be bound up with a certain ring tone, as well as a picture or photo. 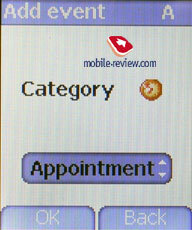 When creating a new entry, one can choose storage place: either in the phone’s main memory or on SIM-card. 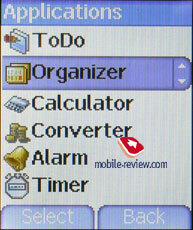 All contacts saved in the main memory and SIM-card can be displayed either separately or in one list. 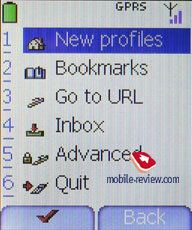 The search is conducted by the first letter, while in “Settings” menu you can choose the way entries will be sorted – by first name or last name. 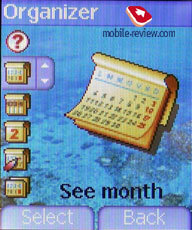 The phonebook features fair capabilities; the only flaw here is rather complicated menu, though it can be gotten used to after a while. 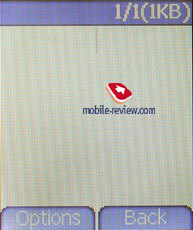 Pictures and photos, allocated to contacts are displayed on the screen when both receiving and accepting a call. Message. 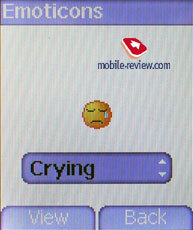 The device supports EMS standard – there is a set of pre-installed emotion icons and ring tones. 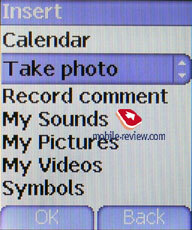 What is more, one can insert events from the calendar and contacts taken from the phonebook, into messages. 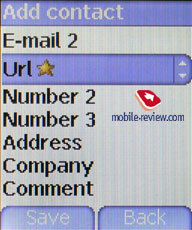 While typing a message you can enlarge font size by pressing #, another way of performing this function is to use the menu; input mode can be changed only via the menu; you can also make up some template messages of your own. There is a possibility of delivering a message to multiply contacts, though in order to do this a mailing list should be created beforehand. 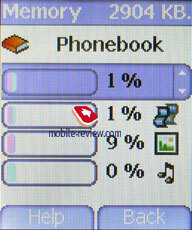 And the last but not the least: the handset is capable of storing the maximum of 160 messages. 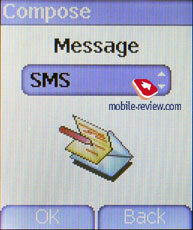 MMS editor is quite simple to use – the message’s body in addition to standard text, pictures and ring tones can include a voice recording with maximum duration of 2 minutes 26 second, which can be made right away by choosing the corresponding item on the menu. 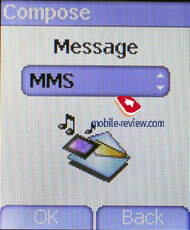 All incoming and outgoing messages are limited to 100 Kb. Applications. 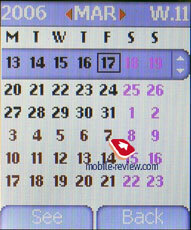 In the calendar you can select one of the available view types: monthly, weekly (divided into hours). 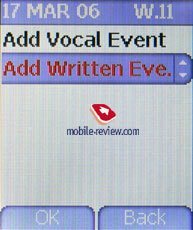 You can create text and voice memos for the events, as well as select type of the event. Starting and ending time are setup, alongside with reoccurrence and beforetime alarm reminder (from 5 minutes up to 1 day). To Do. 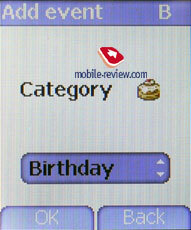 Here one can create reminders – bother text and vocal ones. 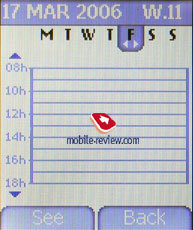 In order to make a task active you need to choose category and set alarm (from 5 minutes to 1 day). A vocal ToDo can last no longer than 1 minute. The device also provides a simple alarm clock, featuring only triggering time. Also at your service: countdown and a common calculator with currency converter. Multimedia. 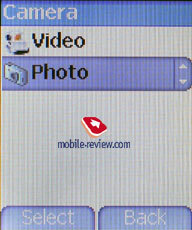 Folders in which photos and pictures, video clips and ring tones are stored can be accessed here. Settings. This section contains sound settings – one of pre-installed or uploaded rings tones can be set as the ring signal. Also you can record call signal using the dictaphone (not more than 30 seconds) – this function can be performed by pressing a special button on the left side panel. 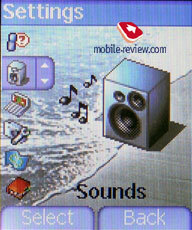 The following file extensions are recognized as ring tones: MIDI, WAV, AMR. 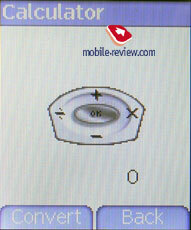 Vibrating alarm may be triggered off along with the ring tone or in “first vibrating alarm, then ring tone” mode. Three color schemes are available for the display, as well as numerous wallpapers and screensavers (which should fit one of the following file formats: wbmp, bmp, png, gif, animated gif, jpeg). 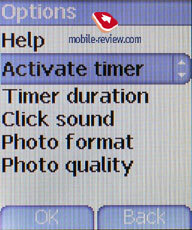 Right here one can adjust contrast and backlight mode: screen only, or both screen and keyboard. 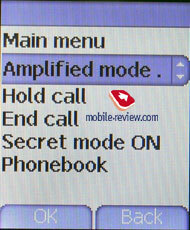 The sub-menu also holds general call record, storing incoming, outgoing and missed calls. Here one can find two counters applied to calls and data respectively. Games. 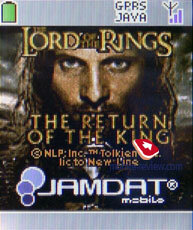 Two Java-games are available. 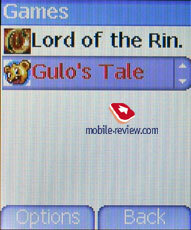 Arcade Gulo’s Tales and adventure Lords Of The Rings. Additional Java-application can be uploaded only via WAP; and when installing one of them, you can choose folders where they will be stored: either in “Games” or “Applications”. Connections. 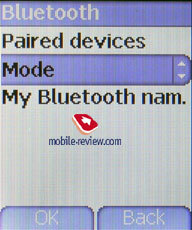 Bluetooth supports the following profiles: SPP: Direct COM Port, Dial-up Networking, OBEX, Headset-AG, FAX. There were no problems encountered during our testing period. 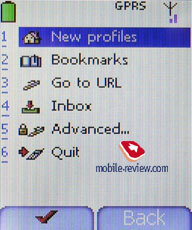 The phone worked fine with desktop PC and other phones as well as headsets. The IrDA is fully-functional and works without flaws. Camera. The phone has VGA-camera. Shots can be made only in two resolutions: 640x480 and 128x160. 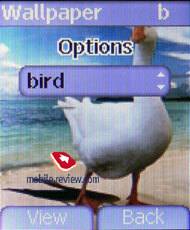 The pictures’ quality is also adjustable: one can choose from high quality or MMS. There’s 4x digital zoom present. In addition to the aforesaid, you’re also at liberty to set timer and select sound for shutter triggering. 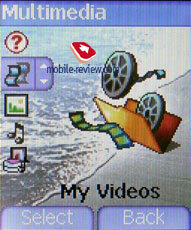 Besides you can record videoclips in 3GP format. Before starting to film you will have to choose either this clip will be recorded without limitations or with ones for MMS message. The network reception quality is typical for modern phones, there aren’t any differences in any of the sides (good and bad ones). The speaker’s volume and microphone’s sensitivity is enough for phone call in almost all conditions. 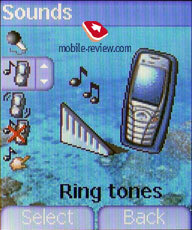 The volume of 32-tone polyphonic ring tone is pretty high, the ring is clearly heard almost everywhere and anytime. 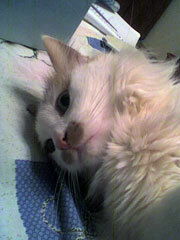 The quality of one is not so good though, the sound is rather deaf. Vibrating alert power is average. 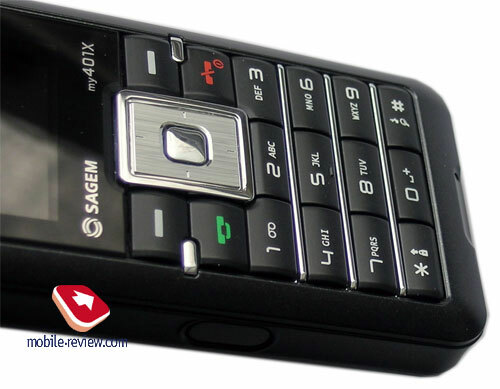 Sagem my401X turned out being quite interesting model, its advantages are fair size and weight, presence of Bluetooth and IrDA, ability to synchronize data with Outlook. Unlike the predecessor, the phone has better case surface, improved keyboard, bigger display (in terms of resolution), but what’s more important is the fact that the screen was improved. 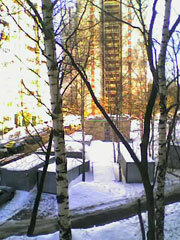 Several drawbacks came as legacy from my301X: lack of Russian input for messages and contacts is one thing that will bother most users from Russia. Just like 301x, this model cannot accept mp3 files sent from other devices, even though this feature can be found in the specifications. 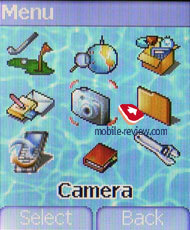 The built-in VGA camera has nothing interesting to offer, it’s more of a small addition, is it pleasant or not? Up to you to decide. I would to more than happy not to have camera in this phone. 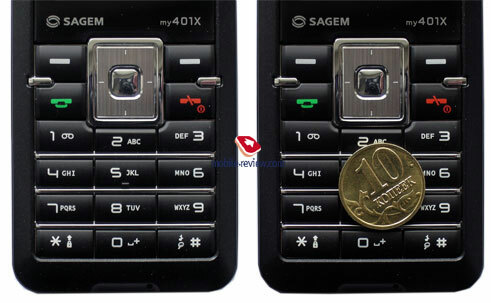 The price difference between Sagem my301X and my401X is around 40USD. 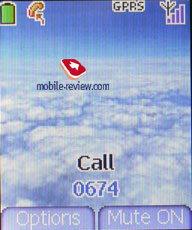 By the time when this review was written Sagem my401X’s price was around 150-160 USD. 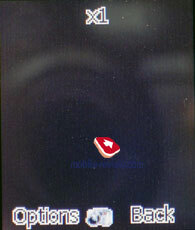 The competitors remain the same as in case with the predecessor, they are: Motorola C390 and Nokia 6021.